I am sure you have heard the news that my good furiend Lucky has found a furever home. He went to the human who initially took him to the Homeless Animals Rescue Team, and who became his foster human. That is a long way from being a cat on the streets and subject to abuse by an evil human. Every time I feel bad about being a diabetic cat, I remind myself I have always had a human who protects and takes care of me. I shared with you the story of Fortune, who was in the same shelter as Lucky. Poor Fortune was stuck in the shelter for even longer than Lucky, and also had a neck wound that needed treatment. Fortune’s injuries were not as severe as Lucky’s but that open wound still caused a lot of discomfort. You will remember that I told you that Fortune was a very pretty girl. Well, I have to change that, because even the humans in white coats make mistakes. Fortune is actually a very handsome boy! Like Lucky and me, Fortune is a special needs cat. He is not a diabetic cat like me, nor did he suffer the kind of abuse that Lucky did. During his time on the streets, though, Fortune got FIV. He can still live a long and happy life if the right precautions are taken, and he found a human who will take those precautions. I often say it takes a special human to take on the added responsibilities of taking care of a special needs cat. That is exactly what happened with Fortune. The kind human who adopted him was drawn to him because of his illness. She went to visit Fortune, and it was love at first sight. Now Fortune has a furever home! Fortune’s foster human, and the human who adopted him deserve a lot of thanks and I send them purrs, happy paw taps, and head bonks. But you humans deserve them too. If you did not step up and help Lucky, then HART would not have been able to help Fortune, too. It is because of the kindness of many humans that Lucky, Fortune, and many others have been helped. My human told me to sing that song this morning, and he told me it is from a famous entertainer who did shows for small humans. And that is what it is today. It is a very nice day, especially since our human has let me and Jacey spend some time on the balcony. He even lets us relax there without constantly checking on us because Jacey is no longer being bad and going on the outside of the balcony railing! So not only is our human nice to take care of a diabetic cat, but he is nice enough to reward us when we are good. Speaking of good, I had some good stories to share with you recently that you may not have seen, so I wanted to pass those along today. It is always a happy day at Tenth Life Cats when one of my fellow felines finds a furever home. Well, this week, Dill and Jem, who were feral cats that Tenth Life took the time to socialize, found a furever home for the second time. Their story finally concluded with a happy ending, after many sad developments. And my good furiend Lucky has taken the next step in his recovery from the burns inflicted on him by a cruel human who dumped acid on him. Lucky is now at a foster home. He joins his good furiend Fortune in a foster home. These two special needs cats were helped by the wonderful humans at the Homeless Animals Rescue Team in Fairfax. To do these wonderful things, kind humans running these organizations need your help. 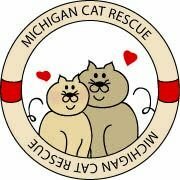 And right now, Michigan Cat Rescue needs some kitten food. They are the ones who nursed sweet Bindy, who was abused, back to health. Can you help them by buying a little kitten food so that they can help more of my fellow felines? Well, it is time for an ear stick for this diabetic cat, so I will tolerate it and then hiss at my human for doing it. But at least you have some fun stories to read! Our Furiend Lucky Has Left the Spa! Lately, much of the news I have shared with you has been sad news. So today, I am very happy to give you wonderful news. You remember that our furiend Lucky was recovering from the horrible injuries that were inflicted on him. A cruel human dumped acid on our ginger boy. But after that horrible treatment by one human, many humans rallied to help Lucky recover. His wounds were gruesome and ugly, and he had to stay at the recovery room at Parkway Veterinary Clinic. As a diabetic cat, I complain a lot about the needle sticks and ear sticks. That is nothing compared to what Lucky had to deal with. But this didn’t stop Lucky from showing that he had a big heart and lots of love to give. He even called the recovery room the spa! The spa was Lucky’s home for months, as the injuries that were inflicted on him healed. It was always supposed to be a temporary place for Lucky, and while he was happy there, he always wanted to go to a home. Well, today, Lucky got his wish. He left the spa today, and made it to a foster home. There were many people who wanted to take in this brave and loving cat so that he could experience the love and care that he deserves. While Lucky would have been happy to go to any of these homes, he ended up going to the home of the photographer who has shared so many wonderful pictures of Lucky with us. Lucky will have an appearance in the Washington DC area coming up, and he says he has a new furiend to share with us. And don’t forget, Lucky already has one furiend who is looking for a furever home, Fortune. Lucky, Fortune, and me are all special needs cats. I am a diabetic cat. Lucky had to deal with his horrible injuries. And Fortune had to deal with a bad wound on her neck and is fighting FIV. But while our challenges are all different, there is one common bond we have. As this video of Lucky making biscuits should show you, there is absolutely nothing wrong with our hearts. When it’s time for you to bring another furiend into your life and home, I hope you will consider adopting a special needs one.